“Labs-Around-Me” is a sharing economy concept for the world of research laboratories. Such labs can share chemicals, antibodies, plasmids and more, with other labs around them. As LabSuit's concept of “Labs-Around-Me” has evolved, more and more researchers have experienced amazing WOW! moments when they begin to understand the benefit of our platform. This is a story of something experienced by a LabSuit subscriber not so long ago. As we all know, “Labs-Around-Me” allow facilities and researchers to participate in a special LabSuit community. The community includes hundreds of labs - and, through a simple interface, allows them all to collaborate in locating and exchanging chemical reagents. Every day LabSuit delivers hundreds of messages between universities - as well as internally, within the same campus. Researchers ask questions about chemicals, buffers, and sharing protocols. Most often, they courteously request small amounts of some hard-to-get reagent. May I borrow a little phosphorous trichloride? This banal message was the first to be seen by a masters student from a lab at Tel Aviv University, while eating her breakfast. 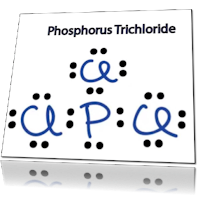 A post-doc from Ben-Gurion University (Southern Israel) courteously asked to share a few milligrams of reagent called phosphorous trichloride, (PCl3). This chemical compound is used in preparation of herbicides, plasticisers and more. The post-doc explained that he urgently needed PCI3 for his research - since his post-doc position was coming to an end, and he urgently needed to finish his work. The event was nothing unusual - until two weeks later when the same lab received another request for PCl3! This time the message was from a desperate post-doc at Israel’s Technion, in Haifa. Apparently, he had contacted every chemical supplier in the country, but none had any PCl3! Well, such coincidences happen, and it's not that rare that two labs need the same reagent almost simultaneously. Help me complete my thesis! To LabSuit’s surprise, it happened again one week later! This time a PhD student needed a small amount of this mysterious PCl3 for his final thesis experiment. Then, we at LabSuit began to wonder. What’s so special in PCl3 and why does everyone suddenly need it? We decided to contact the PCl3-friendly lab at Tel Aviv University and ask the principal investigator what was so unique about this reagent. 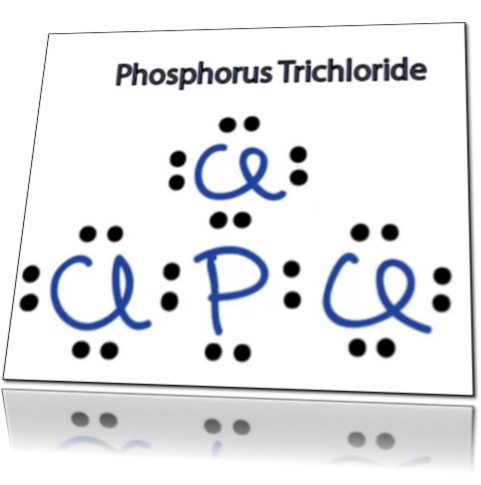 "When I launched my lab not a long time ago, I knew I would require phosphorous trichloride throughout the whole of next year for my research. PCl3 cannot be shipped by air transport but only by sea! Therefore, each delivery may take up to six months. My lab ordered enough PCl3 in advance, that's how, I think, my lab has become a primary source of PCl3 for other labs :-)"
Usually the opposite is more common; when a new investigator joins a faculty and starts his/her research, Labs-Around-Me helps him/her get the reagents from nearby labs. However, this case was different: the Tel Aviv lab was headed by an enthusiastic young professor who became the only source of PCl3 in Israel for an entire half year - while commercial suppliers were waiting for it to arrive by sea. During the next several months more PCl3 messages filled LabSuiters's inboxes and all of them got their own special happy-end - often, in the form of a published paper! Being able to share and exchange resources so easily was a WOW! moment for so many of the researchers involved. That’s when they realized the full benefit of LabSuit’s services. 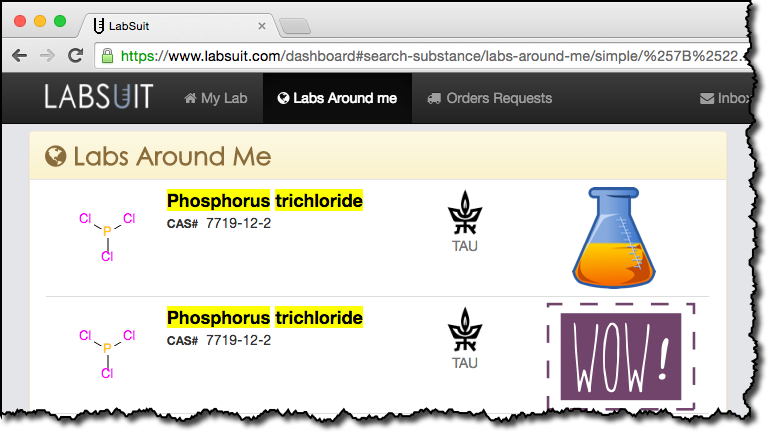 Labs-Around-Me cooperates with ICS (Israel Chemical Society), to create a web platform, where labs can find and exchange reagents they need. It’s highly efficient, time-saving and resource-friendly. Often labs, need a small amount of reagent, to conduct a preliminary experiment, kind of proof-of-concept before buying a large amount of the reagent. Here, at LabSuit we felt great satisfaction, since we helped several labs get what they needed in the shortest time possible, eliminating long delays. Moreover, LabSuit tightened the relationship with these labs, leading to even more fruitful collaboration. Labsuit is amazing and effective. Truly recommended for anyone who has a lot of chemicals and lab supplies to manage. It's been a wonderful time together! When are you planning to visit us next time?